Engadget’s tipster claims that AT&T already have the next iPhone model named iPhone 4s — with lowercase ‘s’– in their inventory system. As you can obviously see, the inventory system is showing a white iPhone 4s and it’s not displaying the storage capability like the rest the iPhones in t he system. Judging from the clandestine screenshot you see above, it most certainly seems like that’s the case. 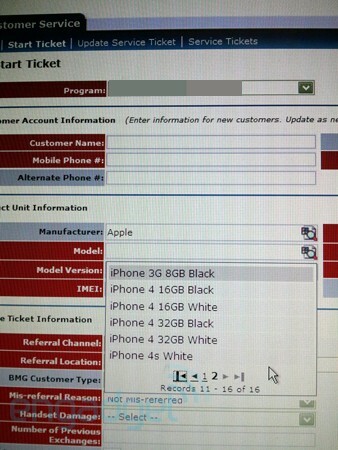 A helpful tipster sent us this tasty morsel, from AT&T’s internal system, listing the “iPhone 4s White” beneath a handful of already familiar Apple handsets. Could it be? Is Cupertino actually planning on bringing a white version of its next iPhone out at launch? We’re afraid only time will tell. Apple is rumored to introduced the next iPhone in the next few weeks — naming the device iPhone 5 or iPhone 4S. However, a number of rumors points out the next Apple iPhone to be called iPhone 5.